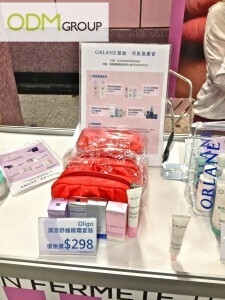 Our ODM staff came across a selection of products advertised at a small Orlane booth in the MTR station. This French skincare brand prides itself as one of the tops that uses high technology formulas for their products. As part of their promotion, for any skincare product purchased, a free toiletry bag would be given. Particularly for women, they will spend a little extra on beauty products. Therefore this free pouch could be a great item to draw more sales in. Moreover, if the item is branded with the Orlane logo, it could further help with brand recall. This item could come in really handy when travelling.